Downloadable files are in Adobe Acrobat PDF format. You can download the viewer free of charge from Adobes website. Notes on the Realization of Scambi. The ‘open’ form – literature and music. Paper presented at the ‘Scambi Symposium’ Goldsmiths College. February 18th, 2005. A chronological catalogue of Pousseur’s works. An alphabetical listing of Pousseur’s works, for use with the chronological catalogue (above). Graphic file of the flyer (see above) for the two concerts on 21st and 22nd November, 2004. A Keynote Lecture by Professor Henri Pousseur given as part of the Symposium on ‘Open’ Works at Goldsmiths College, London, 18th February 2005. 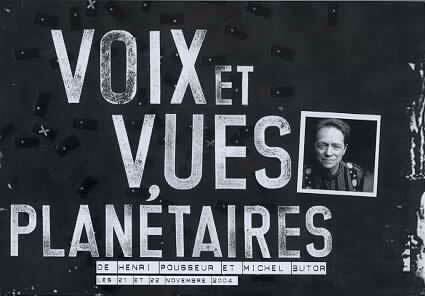 The programme of the UK premiere of Pousseur's Voix et Vues Planétaires. 7.00pm at the Conway Hall in central London on Saturday 24th February 2007. The Studio di Fonologia Musicale della RAI Milano: Maderna and Pousseur by Prof. Pascal Decroupet of the Université de Nice (Faculté des Lettres, Arts et Sciences Humaines). Prof. Decroupet provides background information about the ‘Studio di Fonologia Musicale’, where ‘Scambi’ was realized, in addition to describing the composition itself. This text is an expanded version of his 1997 text: ‘Studio di Fonologia Musicale della RAI Milano’ in Im Zenit der Moderne Freiburg im Breisgau: Rombach Verlag, vol. 2, Chapter VI Elektronische Musik, pp.99-104. Interested readers are advised to consult this publication for more information. Pousseur’s Scambi (1957), and the new problematics of the open work by Dr Craig Ayrey, Music Department, Goldsmiths College, London. Scambi – description of a work in progress (1959) by Henri Pousseur, a new translation by Christine North 2008. Henri Pousseur wrote this text on the realization of 'Scambi' in 1959. It appeared in the Gravesaner Blätter in a German translation with an English summary. The importance of this document cannot be underestimated with reference to 'Scambi' and the 'open work'. However, the English summary could not do justice to the text and, therefore, Christine North returned to the original text in French in oder to do a new and complete translation. This is an edited transcription of an interview with Prof. Pousseur at his home in Waterloo, Belgium, on June 14th, 2004. This was the first meeting between Prof. Pousseur and two members of the 'Scambi Project' team: Dr John Dack and Dr Craig Ayrey. Prof. Pousseur described his work methods in realizing 'Scambi' and the 'Huit Etudes Paraboliques'. He also talked at length about his 'audiovisual music' project: Paysages Planétaires. Additional documents will appear here as the project progresses. Please return to this page later to find translations of key texts as well as texts written by the team members. We intend also to provide a resource with audio examples of the open form in instrumental as well as electroacoustic music.